Our week-long guided fishing trip puts you fishing “Outpost creek” on foot most of the week, but you also have the option for more fishing diversity and adventure with a jet boat ride to 3 other small creeks down river of our base camp. “Outpost creek” is fairly wadeable along its entire length, minus the deep runs and pools. ( A wading staff is helpful for some fishermen.) 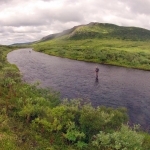 And we access different sections of this incredible stream with hikes across an open tundra plateau, taking a new trajectory each day from our basecamp. The shortest walk across the tundra to the creek is 10 to 15 minutes. There is also 30 minute, 45 minute and hour+ trajectories to the water. Those willing to take even longer hikes (100+ mins.) will definitely be rewarded – there is some spectacular and untouched water that few people will ever see. As a moderately strenuous fly fishing adventure, guests should be in excellent physical shape to fully enjoy the week. But our jet boat does help alleviate some of the walking required to access our home creek.